Clean air is necessary for proper combustion in your Toyota, making your engine air filter a crucial component of your vehicle. You can make sure your engine gets clean air to run properly this winter when you take advantage of this special offer to get our engine air filter replacement service for just $44.95 with this coupon. A new engine air filter will keep unwanted particulates from entering your engine so that your fuel burns clean and efficiently. 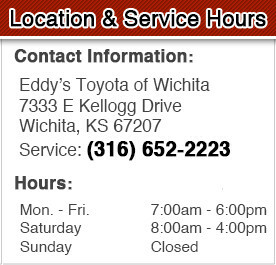 Protect your engine and get better performance today with our engine air filter change service at Eddy's Toyota!